The key objective of ACSAD-GIZ cooperation has been to strengthen ACSAD to act as a service-oriented centre of excellence for technology transfer and information management aiming at the promotion of UNCCD implementation in the Arab League. GIZ has provided technical and scientific support to develop national strategies and to build national and regional capacities on conservation of natural resources and rehabilitation of degraded land resources. In 2006 ACSAD supported by GIZ launched its CA programme. In the season 2007/8 experiments were established at the ACSAD Research Stations Izraa and Jellin and accompanied by on-farm experiments. Beginning with 25 trials in 5 provinces in the season 2007/8 with a total area of approximate 25 ha. The number was extended to 56 farmers in 6 provinces with a total area of approx. 150 ha in the season 2008/9. During the season 2009/2010 the area expanded to more than 700 ha. These trials were established in cooperation with the extension service. 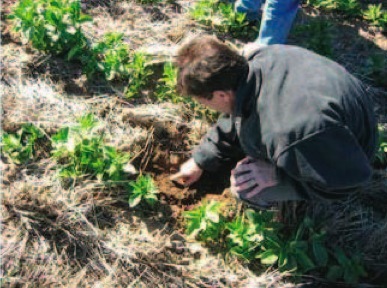 On-Farm trials were closely monitored, with focus on a few key parameters of soils and crop development, only, in order to provide sufficient statistic data, which are needed for the propagation of the system. The work was undertaken by the Syrian extension service with support from the project. Conservation agriculture (CA) aims to achieve sustainable and profitable agriculture. Conservation agriculture has shown successful results in different geographic and climatic regions around the globe. It improves soil quality (chemical, physical and biological parameters), while reducing production costs and labour burden. 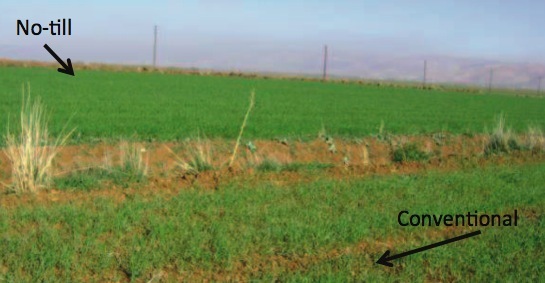 No tillage and planting through a soil cover or crop residues not only suppresses weed growth but reduces unproductive water losses through evaporation (a detailed description of how CA is one is covered in the methodfinder module). Lower precipitation in the Arab world and declining ground water tables, due to uncontrolled pumping of irrigation water, asks for production systems that produce more crop per drop of water (increased water use efficiency). Cut of government subsidies has led to sharp rise of fuel, fertilizer and seed prices, putting farmers under pressure to reduce production costs. All this calls for a change of production systems and CA is an alternative. Continuous minimum mechanical soil disturbance. Diversification of crop species grown in sequences and/or associations. Even though the changes of soil characteristics take time, initial changes as a result of CA include increase in soil organic matter. 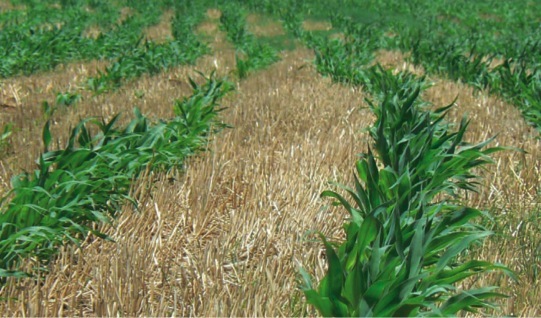 This is due to ensuring good crop residue management and slower decomposition as a result of limited soil disturbance. In Syria crop residues are either grazed or sold thus only little organic matter is traditionally returned. CA has encouraged farmers to manage their residue more effectively. Due to the drought yields were relatively low and hardly differed between treatments. Significant yield differences are expected only after some years when soil characteristics have improved under CA practices. However, because the input has been reduced dramatically, the overall economic farm performance has been significantly improved. In most cases CA gave higher yields, ranging between 3 and 87%, in some cases lower yields were observed, however this was related to bad adjustment of the direct drill which resulted in a bad seed placement. Production costs of Conservation agriculture (CA) are much lower, compared to Conventional agriculture (CV), the reasons being mainly savings for fuel and labour, i.e. costs of ploughing. Further savings are made by lower seeds rate, by using a precision drill instead of broadcasting seeds. In the 2007/8 season production costs were reduced on the average by 139 SYP/dunum, from 1157 to 1017 SYP/dunum, a cost reduction of about 12%. This reduction is caused by not ploughing (two times). In the 2nd season, i.e. 2008/9 CA production costs were reduced by 14% on the average, 1.400 SYP/ha. Savings can be even higher, depending on the crop and its seed price. This reduction of production costs is a deciding factor, as savings are made independent of the season (dry or wet) and the crop development. Due to the drought yields in the season 2008/9 were again relatively low and differed considerably between farms. But as yields under CA are in general not lower, farmers gain when adopting CA practices. In the average of all trials, the net return of CA fields increased from by 11.160 SYP/ha, i.e., an increase of 47.5 %. Reduced production costs of CA practices can in most cases compensate for potential revenues from selling crop residues or renting fields to herders. Straw was sold at 2150 SYP/ha in Sweida; in other provinces at 5000-6000 SYP/ha (8-12 SYP/kg), or fields were rented to pastoralists at 9000 SYP/ha. Ploughing and harrowing, i.e. 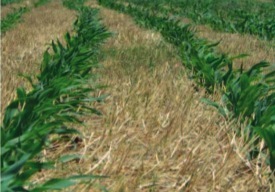 preparation of a “Clean seed bed” is a means of weed control. It shall give emerging crops an advantage of weeds. But ploughing brings seed from the seed bank in the soil to the surface and stimulates germination. With CA weed seeds remain in the seedbank and less seeds germinate. Weed population changes over time. Noxious, difficult to control weeds, like grasses, are replaced by weeds that are less competitive and easier to control. Crucial is a good weed control in the first years when changing from conventional to conservation agriculture. But experience shows that it is not true that with CA more herbicides need to be applied. The contrary is true, when CA principles are applied in a correct way. Farmers cultivate the soil under fruit trees and olives, as they fear competition for water by weeds. However this practice is not only costly but also favours soil erosion and damage of tree roots thus favouring root infection by fungal diseases. Controlled growth of forage legumes or even spontaneous vegetation on the contrary prevents run-off and thus loss of precious rain water, stops soil erosion and builds up soil productivity. However, fluctuation in yields is still a problem in teh orchards. 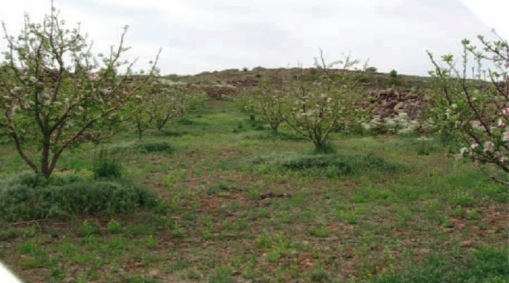 Thus the owner of a farm at Sweida, started in 2008/9 with no-tillage in his apple plantation. He sowed either a yellow sweet clover (Melilotus officinale) or allowed spontaneous vegetation to grow and cut it with a mower towards the end of the season in order to avoid competition for water. The harvest (quality and quantity) was much better than of the neighbouring farmers and no decease was observed, which was related to the improved biodiversity. Because of the positive impact, the farmer is increasing the area under CA and is testing additional plants as cover crops (mainly leguminous). Despite some scepticism farmers are highly interested in the new production system, and ready to try it on their own fields. Most attractive to farmers is the reduction of production costs. Ploughing is becoming more and more expensive, as the price of fuel has recently increased sharply, and will continue to rise. Substantial savings are also possible for seeds, as seed rates can be reduces by almost 50% with the precision drills. In the long run also expenses for fertilizers can be reduced, as localized placement of fertilizer increases the efficiency, allowing farmers to reduce the rates. Owners of large farms around Alhasaka are even ready to buy direct drills, seeing the economical advantage of Conservation Agriculture. Adoption rates have been further increased with more than 25.000 ha coming under CA cultivation in 2011. This process was supported through the active propagation by the Syrian extension officers. Farmers in orchard system, where most of them are applying the no-till system in order to make savings continue to adapt the system on their own. Support is being provided by Syrian extension services who encourage the farmers to enhance their soil by planting leguminous crops as intercropping and to enhance soil nutrients.